Yesterday we watched I am Legend starring Will Smith a scary Sci-fi story sets in New York in 2012. where Neville (smith) a military scientist, immune in the virus. all alone and surviving, he wants to find a cure for the virus that has destroyed most of the human race. He drives to the city with his german shepherd (Sam)by the day, at night he barricades his home from the monsters. In the end he found the cure but he died. Honestly it is the most anti climactic film i have ever seen. I am Dissapointed in the story and action scene. Next movies in our list is KungFu Panda starring jack black (Po), Angelina Jolie (master tigress) Jackie chan (master Monkey) David Cross(master crane) Lucy Liu (master Viper) seth Rogen (master Mantis) Dustin Hoffman (shifu) Ian Mcshane (Tai Lung). 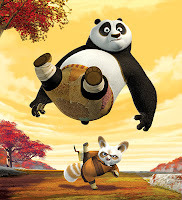 Po the lazy panda must learn the art of KungFu in order to save the valley of peace from evil snow leopard tai lung.